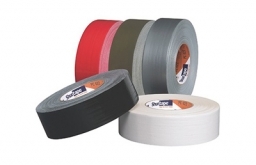 Description: 8 mil utility grade duct tape, with natural rubber adhesive, combines with a 100% Dacron® cloth/polyethylene (PE) film to provide a quality utility product. Consistent tensile and even tear in both cross and machine direction. Excellent conformability to irregular surfaces. Common applications include packaging, wrapping & sealing, binding & bundling, abatement and general maintenance and contractor uses, patching, mending, book repair, and color coding. 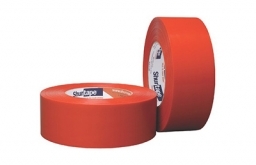 Description: 13 mil high tensile strength, very durable duct tape with clean release. Used for duct sealing, heavy duty packaging and general purpose applications, including contractor and manufacturing uses. 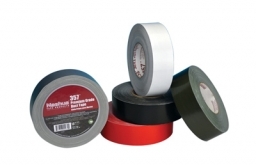 Standard Widths: 2" & 3"
Description: 11 mil professional grade nuclear duct tape with clean release used in a broad range of applications, including hanging and patching polyethylene, HVAC contractor uses, seaming and securing underlayment materials, and general repair. Excellent performance where high tensile is not critical. 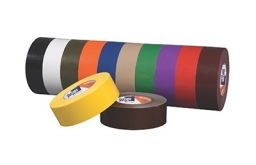 Description: 12 mil military grade PE coated cloth duct tape, used in military and aerospace applications, including media blast protection and surface masking, challenging repair, bundling, and seaming. Meets the following specifications: ASTM D-5486 Type IV Class 1, DPM 871-3. 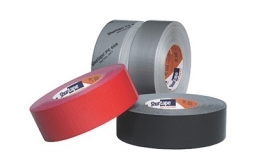 Description: 9 mil general purpose duct tape, with natural rubber adhesive, used for a variety of applications including general repair, abatement, and contractor uses. 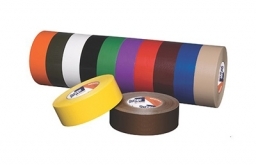 commonly used for bundling, patching, mending, book repair, and color coding. 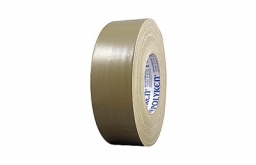 Description: Contractor grade cloth duct tape used in the HVAC industry for sealing metal and flex duct work, and patching and mending thermal insulation. Tested in accordance with UL 723. Colors: Silver, Black, Red, Printed. 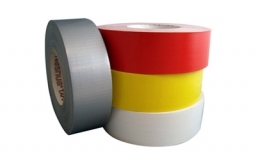 Description: Performance grade cloth duct tape, used to seal cartons, bind books, repair seats, bundle wires, splice, repair, and seal hatch covers and cargo doors in the shipping industry. Use as a condensation barrier in appliance assembly. Tested in accordance with UL 723. 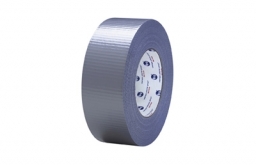 Description: Premium grade cloth duct tape used for protection of window and door frames during stucco application, high performance motorsports applications, and heavy duty bundling, holding, and splicing. Tested in accordance with UL 723. Flame Spread Index 10; Smoke Development Index 10. Description: 9 mil general purpose cloth duct tape, used for packaging, bundling, sealing, seaming, holding, waterproofing, plumbing, carpet, splicing and other home and general repairs. 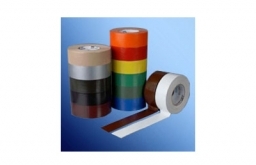 Description: UV resistant, polyethylene film tape used to mask surfaces during stucco application and painting. A special synthetic high-tack adhesive provides a watertight seal in severe environments and weather conditions. Residue free. THIS IS ONLY A REPRESENTATIVE SAMPLE OF OUR MORE EXTENSIVE PRODUCT LINE. IF YOU DON’T SEE WHAT YOU’RE LOOKING FOR, JUST ASK!